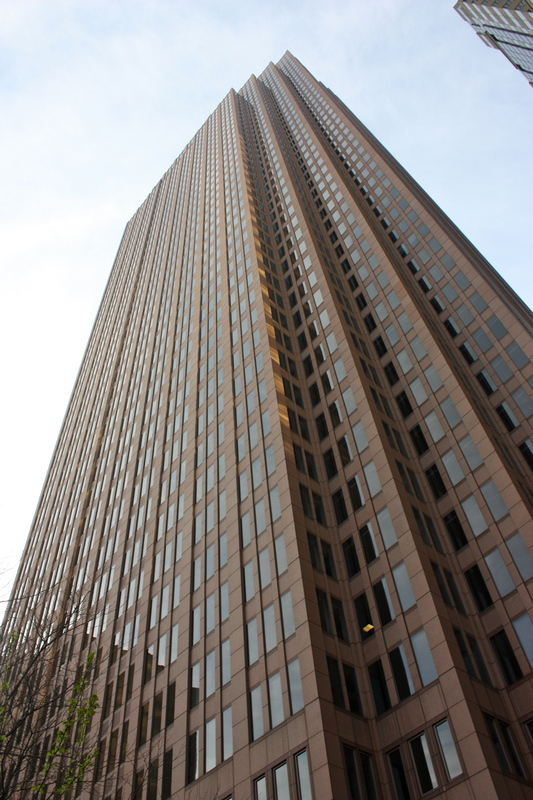 The Bell Atlantic Tower- 50 flights (1,088 steps) to the top. Whew! But let me tell you… that doggone Climb was no joke! I was cool for the first 10 flights or so, but by the time I hit the 35th floor, I was like “Why the heck did I sign up for this?” My legs were hanging in there, but the higher I climbed, the harder it was to breathe. I, along with many other climbers, was beginning to suffer oxygen debt (physiological state produced by vigorous exercise, in which the lungs cannot supply all the oxygen that the muscles need). I could actually hear myself breathing- loudly. Felt like my nose and mouth were Saran-wrapped. Now I really know why this is called the Fight for Air Climb. Sheesh! For the last 15 flights or so, all I could hear in that warm, narrow stairwell was the heaving surround sound of men and women trying to reach the top of the tower. Cool air was blowing from the vents but that offered little comfort. I began to feel nauseous. I wanted to give up in the. worst. way. Shoot, I willfully enlisted in this… I didn’t have to finish! Every breath I took felt like torture. You couldn’t tell me my head wasn’t about to explode. And I volunteered for this mess. Yes, I volunteered for it. And I’m going to do it again next year. There are so many people in this world who don’t volunteer to have difficulty breathing: children plagued with asthma, people suffering from COPD (Chronic Obstructive Pulmonary Disease) attributed to air pollution, and the roughly 3,400 nonsmoking American adults who die of lung cancer each year as a result of breathing second-hand smoke. This Stair Climb made me ever so thankful for healthy lungs and my ability to inhale and exhale without difficulty or distress. Every breath I take is a blessing. I want to continue to breathe awareness about the deadly disease that strangles the air from so many- including my father. I have a new-found respect for all the Firefighters of the world. Some of these guys finished The Climb quicker than me- wearing all their gear/equipment! Oxygen, a basic gas, is needed by every cell in your body in order to live. The air that comes into the body through the lungs contains oxygen and other gases. In the lungs, the oxygen is moved into the bloodstream and carried through the body. At each cell in the body, the oxygen cells are exchanged for waste gas called carbon dioxide. The bloodstream then carries this waste gas back to the lungs where the waste gas is removed from the blood stream and then exhaled from the body. This vital process, called gas exchange, is performed automatically by the lungs and respiratory system. Bringing air to the proper body temperature. Moisturizing the inhaled air to the right humidity. Protecting the body from harmful substances. This is done by coughing, sneezing, filtering, or swallowing them. WOW… our lungs are heavy-duty machines! Exercise is crucial to the maintenance of our lungs and our bodies as a whole. And stair climbing is great exercise! According to Dr. Oz, “Fitness gains from doing 11 minutes of daily stair climbing for eight weeks rival those of walking 36 minutes a day for six months.” Now put that in your pipe and smoke it (no pun intended)! When we don’t take care of our lungs, we decrease our ability to breathe freely and increase our risk for lung disease, stroke, and heart disease. I don’t like the sound of that. And neither should you. Think you’re at risk? Know the Warning Signs. And understand what smoking does to your body. Don’t voluntarily restrict your respiration. Do whatever it takes to lower your risk for lung disease. And take action to join the fight for healthy air. Changing an unhealthy lifestyle may be difficult, but it’s worthwhile. Take one step at a time. Those few breathtaking minutes in that suffocating stairwell poignantly proved just how much I’ve taken advantage of my ability to breathe. Lord, please forgive me for taking my breath for granted. Every single one of the 17,000 breaths I take per day is a gift. Help me to use my gifts wisely… responsibly. With every breath I take, help me to speak life and not death. Help me to lift up and not tear down. Help me to spread Your Word, and not spread rumors, lies, and gossip. Show me how to be a better steward of the lungs You entrusted to me. Recognizing that every breath I take is on loan from You, show me how to use it for Your glory. You are the Air I breath. Amen. Do you know someone who has suffered from asthma, pneumonia, COPD, bronchitis, emphysema, lung cancer, SIDS (Sudden Infant Death Syndrome) or any other lung disease? Are you concerned about a loved one’s smoking habit? Please share your story/their story below. Your testimony could be the very catalyst necessary to change someone else’s life! 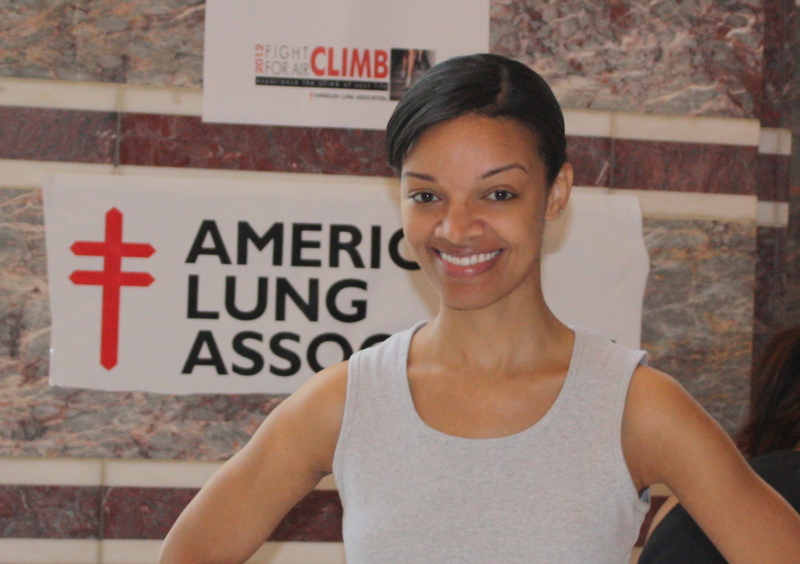 This entry was posted in HEALTHFULly Yours and tagged American Lung Association, Lung Disease, Lung Health, Philadelphia Fight for Air Stair Climb, What Smoking Does To Your Body by The Practical Chick. Bookmark the permalink. That was insightful. I’m very proud of you First Lady.